Ben Bernanke (born 1953) is a Jewish-American Keynesian liberal economist who from 2006 to 2014 was Chairman of the Federal Reserve, one of the most powerful positions in the country. He was replace by Janet Yellen. A Republican, he was appointed by President George W. Bush to succeed Alan Greenspan. He has been nominated by President Obama for a second four-year term as chairman beginning in 2010. Bernanke took control in early 2006 when the economy seemed to be booming, but it was in the last stages of a housing bubble—and the bubble burst in 2007-8. He has been praised by liberals and moderates widely for his aggressive efforts to combat the Financial Crisis of 2008 and the resulting Recession of 2008. However, proponents of free market capitalism said Bernanke should not have bailed out failing firms and instead should have allowed free market capitalism to quickly recover as it did in the depression of 1920 without government intervention (free market capitalists assert that government intervention drags out economic recessions and depressions). A 2005 study found that government corporate bailouts are often done for mere political considerations and the economic resources allocated exhibit significantly worse economic performance than resources allocated using purely business considerations. In addition, he has also been blamed for regulatory failures that helped cause the crisis, and he helped engineer the wildly unpopular financial bailouts of giant banks and insurance companies. Wall Street reacted with near panic on rumors that he would not be reconfirmed in Jan. 2010, fearful that Obama might appoint someone much worse. In February 2010, concerning the Obama administration's monetary policy, the world renowned investor Jim Rogers said that the European Union, Chinese, and Australian central bankers are more competent and honest than the Federal Reserve and that Federal Reserve Chairman Ben Bernanke is "throwing gasoline on a fire" via his inflationary policies which are debasing the United States dollar. Bernanke played a major role, along with Treasury Secretary Henry Paulson in forging a vast, extremely expensive response to the Financial Crisis of 2008. The Fed and Treasury commitments exceeded $1 trillion in direct aid and over $6 trillion in loan guarantees as stock prices returned to 2003 levels. In October Bernanke endorsed an eventual stimulus program that gave support to the proposed spending plans of Barack Obama. In August 2009, economists on the Wall Street Journal panel are nearly unanimous that Bernanke should be reappointed to another term as chairman. However, a majority of these same economists failed to predict the 2008 recession. The economists of the conservative school of economics, called Austrian economics, did predict the recession of 2008. Barack Obama, who has shown that he has little understanding of economics, has nominated Ben Bernanke to a second term as chairman of the United States Federal Reserve. On December 1, 2009, the Foreign Policy Magazine misguidedly named Ben Bernanke one of 2009’s “Greatest Thinkers". He was also the liberal Time magazine's "Person of the Year" for 2009. Bernanke was born in Augusta, Georgia, later moving to Dillon, South Carolina. He excelled academically, becoming class valedictorian at Dillon High School. His academic record and near perfect SAT scores led to his admission to Harvard as a member of the Class of 1975. After receiving his undergraduate degree, Bernanke chose to continue studying economics at MIT under the supervision of Professor Stanley Fischer. His PhD thesis, "Long-term Commitments, Dynamic Optimization, and the Business Cycle", was accepted in May 1979. He has taught at Stanford, New York University (NYU), and Princeton. Dr. Bernanke joined the Federal Reserve Board of Governors in 2002. 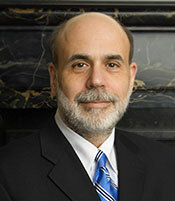 Dr. Bernanke and his wife, Anna, have two children. Bernanke is a Republican and was appointed to the Federal Reserve Board, and elevated to Chairman, by Republican President, George W. Bush; he was confirmed by the Senate in 2006. A video of Ben Bernanke's failed economic predictions can be found HERE. “ Let's revist what the Fed's top guy, Ben Bernanke, said about the housing crisis back in May 2007. He was reviewing the pain the subprime mortgage market was suffering, which as then at a delinquency rate at somewhere around 11 percent (it's closing in on 40% now). As you might expect from a trained economic historian, he does a great job of explaining what has happened. But when he tries to get predictive, things go haywire. "All that said, given the fundamental factors in place that should support the demand for housing, we believe the effect of the troubles in the subprime sector on the broader housing market will likely be limited, and we do not expect significant spillovers from the subprime market to the rest of the economy or to the financial system," Bernanke said. How'd that turn out? According to the government's own measures we were in a recession just about six months later and less than a year later, the financial system started to burn down. As you know, subprime delinqencies lept from 12% to 38%. Prime mortgage delinqencies increased something like 500%. Do we have any reason to believe that Bernanke and his buddies at the Fed have suddenly become a lot smarter about the troubles we are facing. The charge that Bernanke's excessive money printing is inflationary is a valid charge which debases the United States dollar is often made by individuals who hold to a more conservative economics such as Ron Paul. “ The Second Congress of the United States passed the Coinage Act of 1792. The act established the Dollar as the currency of the United States and defined precisely what a Dollar was: 24.1 grams of pure silver. To ensure the quality of America's money, three coins were taken from every major batch minted. Each year on the last Monday in July, the chief justice of the Supreme Court, the secretary of the Treasury, the secretary of State, and the attorney general witnessed these coins being assayed. If the sample coins did not meet legal standards, the officers of the mint would be dismissed and the $10,000 surety bonds they posted would be seized. Further, if any officer of the mint was found guilty of embezzlement or of debasing the coins, the penalty was death. Compare that system – where the most senior members of the federal government are in charge of maintaining the soundness of our money – with today's system. Under the current system, the federal government has become the biggest counterfeiter in the world. Fed Chairman Ben Bernanke has tripled the monetary base of the United States in only two years. The Dollar lost 50% of its purchasing power under Alan Greenspan. And since the Dollar was taken off of the gold standard in 1971, it's lost 90% of its purchasing power. Fed Chairman Ben Bernanke has tripled the monetary base of the United States in only two years. The Dollar lost 50% of its purchasing power under Alan Greenspan. And since the Dollar was taken off of the gold standard in 1971, it's lost 90% of its purchasing power. An excellent video of Jim Rogers talking about the gross economic incompetence of Ben Bernanke can be found HERE. ↑ Bernanke, Benjamin Shalom. Long-term Commitments, Dynamic Optimization, and the Business Cycle. MIT 1979. This page was last modified on 9 April 2019, at 00:35.